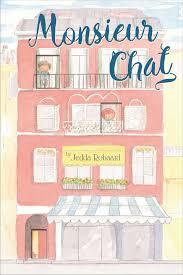 Among the other inhabitants of the very old apartment block around which he roams, are Josephine and Pierre. They have never met despite being neighbours as is often the case in large busy environments. Like Benji, Monsieur Chat becomes the furry catalyst that eventually connects these two thus forming a new friendship and obliterating loneliness. Gorgeously presented with sneaky flaps to unfold in pursuit of le pussycat, this is a picture book to enjoy repeatedly. Perfect for lonely hearts and those finding friendships from three upwards. Nora is bored and rather hard to amuse but Grandma refuses play party to her grouchy attitude by informing her that she’s seen a tiger in the garden. Petulant with disbelief, Nora sets off with Jeff, her toy giraffe on a tiger hunt that uncovers more than just a giant striped feline. It’s the punchy vibrancy of Stewart’s illustrations that really appeal in this winsome tale of imagination. 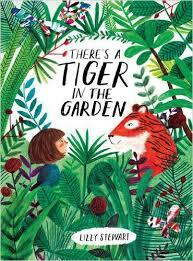 Told with a little tongue in cheek thanks to clever grandma, Tiger in the Garden is faintly reminiscent of having tigers over for tea and a wonderful testament to the simple wonders of childhood. The dynamic duo of Young and Carnavas strike again, almost completing their analogous family roundup of picture books. 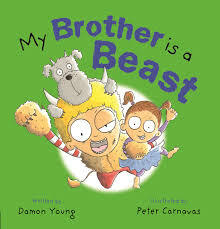 Whimsical rhyme, beguiling characters, and illustrations too funny to ignore make this instalment a hearty read for those icky yucky boy types but will find as many fans with their female siblings. Animal lovers will encounter not only beastly brothers but also plenty of other charismatic animal characters thanks to Carnavas’s mirthful illustrations. This series highlights the hilarious differences between family members across the planet whilst embracing the notion of welcoming those differences. 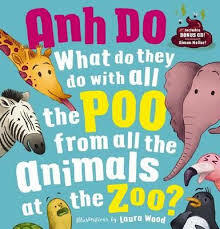 A great question that even I, as a past zoo worker, cannot rightly answer. Thankfully, this is an issue the outrageous Anh Do is not afraid to ask. He tackles this ponderous problem with typical Do uproarious humour providing increasingly hilarious, preposterous scenarios that at some weird level are disturbingly plausible. They even sound justifiably kooky thanks to a jaunty little sing along melody included by Simon Mellor. All the food glorious…er… poo is depicted in eye-catching shades of brown thanks to Wood’s goofy illustrations. Combined, this picture book will have kids hooting and parents grinning with delight. Great fun and a sure fire way to ignite questioning minds and imaginations.